Jake Gyllenhaal. Jena Malone. Patrick Swayze. Mary Mcdonnell. Katharine Ross. Noah Wyle. Drew Barrymore. Maggie Gyllenhaal. Drama. Art House. Science Fiction. Coming of Age. Fantasy. 01 Will's stamp of approval. 01 Tara's Midnight Movies. Peoples' Choice. Rob Recommends. Guardian 1000 Must See (2007). Cult. 01 Mel's Must Sees. Thriller. Recommended. Hearing Impaired (DVD). 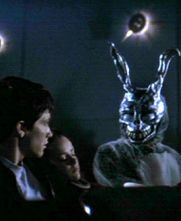 Hailed as the best film debut since Eraserhead, Donnie Darko's instant cult status and mainstream success are well deserved.